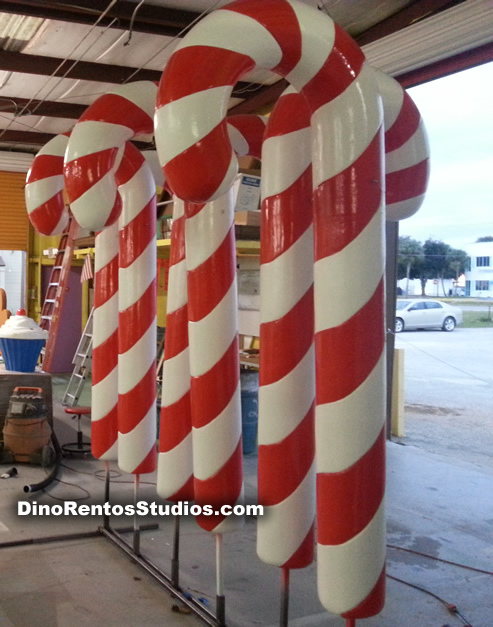 7 Foot Hardcoated Foam Candy Cane - Dino Rentos Studios, INC.
Full 3D candycane hardcoated for indoor or outdoor use. Perfect for you candy or holiday display. Want to build your own Base or purchase one? Includes a 1.25" steel square receiver at the bottom that goes into the bottom of the candycane 12inches deep. So you can manufacture your own base design. You can also select Indoor base below. This gives you a basic base for the candy cane to stand straigh up. You can cover the base with decor. Outdoors? Out door installs are a challenge. The candycanes are fully plastic coated and water tight. Wind is another thing... We can make a weighted base for you candycane. Approx 125 pounds this lays flat on the ground . The candycane secures to this base. You can also stake the base into the ground. The diameter varies and is proportionate to the height. You can build your own base or select add base below for us to make a base for you. or select "add Eyelets" to hang these in the air. Can be used indoor our outdoors. Comes fully Hard Plastic coated for durabilty with an awesome gloss paint job !! Shipping is via freight. And will be billed seperately. Call us for a freight quote. We will contact you to review shipping options and additional shipping costs.